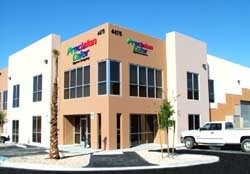 Welcome To Precision Color...where quality is precise! While the rest of the industry was moving towards layoffs or closing their doors, Precision Color was busy expanding and introducing new technology to the visual marketing industry. Unlike many of their counterparts, Precision Color viewed the downturn as an opportunity to focus on streamlining operations and deliver new products that would change the market. This last year, Precision Color decisively separated itself from their competition. Through the power of vision, Precision Color moved to a new level. In order to accomplish this, the company had to expand its facilities to house all the new state-of-the-art equipment. The range of products and services for wide and super-wide printing has expanded at Precision Color with the introduction of the new Océ LightJet 500XL, with the capabilities of printing up to 72”W x 120"H, the Océ LightJet 430, and our Orca 64" & 80" laminator/mounter. By doing so, Precision Color has outpaced its competition by being able to handle all visual display needs under one roof. Feel free to browse through our website for additional products and services. Visit our Company Information site to see a list of our equipment. If you have any questions, our customer service representatives can discuss with you any requirements and to understand your business; from this we can create a professional product that will meet or exceed your expectations.